From the border to Boston and all over the country, families are being torn apart by a government that criminalizes, detains, and deports them. Recently, the Trump administration escalated its racist attacks on immigrants by separating children from their parents at the border and putting them in cages. After public outcry, their “solution” was to keep families together... in detention centers. Jailing families is not a solution. We know that families belong together and free, but this administration isn’t stopping there. Trump is also keeping people from majority Muslim countries from being reunited with their families in the United States. He is still fighting to keep the Muslim Ban in place. The Supreme Court is expected to rule on the ban this week, and we need to let them know they have to overturn it once and for all. This goes beyond Trump. Deportation is part of a system that targets and profits off of immigrants and people of color. Now is the time to be clear: this is about putting an end to criminalization, detention, and deportations in our communities. NO ONE should be kept from the place they choose to call home and the people they choose to call family. Here in Massachusetts, we’re calling on elected officials to protect community members by passing basic protections included in our state budget: YES to due process for detained immigrants, NO to local police acting as ICE agents and asking about immigration status. 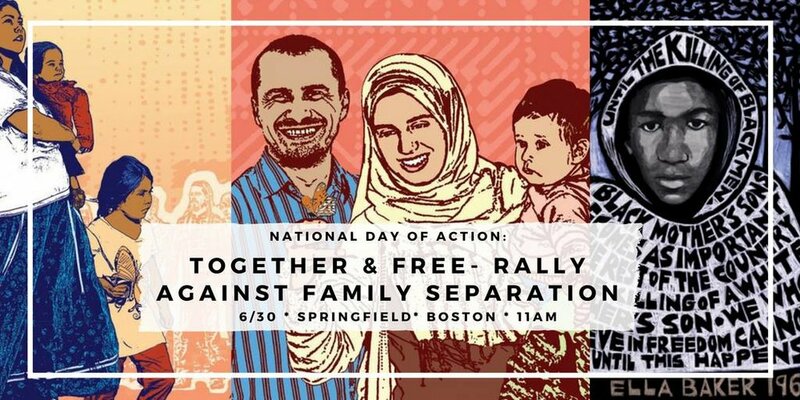 Join us on June 30th to stand against family separation.